Which U.S. states can you visit simultaneously at the Four Corners Monument? You can literally be in more than one place at one time when standing at the Four Corners Monument in the Southwestern United States, where four states join together. Located off US Highway 160, you can visit Arizona, New Mexico, Utah, and Colorado at this landmark managed by the Navajo Nation. Learn more about the Four Corners Monument. Four Corners Monument photo credit: Philip Robertson, purchased from istockphoto.com. What is the wackiest roadside attraction you have ever visited on a road trip? Let us know in the comments! I had heard of the 4 Corners but I didn’t realize that there was an actual monument there – cool! 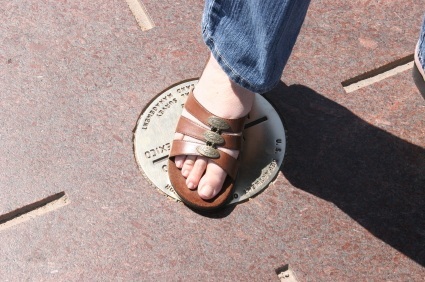 Home » BLOG » Which U.S. states can you visit simultaneously at the Four Corners Monument?